NERF Nitro Flash Fury Chaos Review – While NERF is most popular for their guns, there are other ways to play with their explosive power. Then NERF Nitro Flash Fury Chaos is just one example of a fun way to spend the day without aiming at each other! 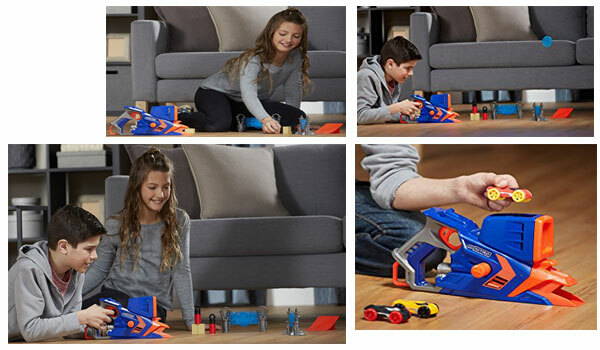 With this playset, kids can use the powerful blast known from NERF to send cars skyrocketing into targets and over obstacles. Create stunts that go high, far, or quick! 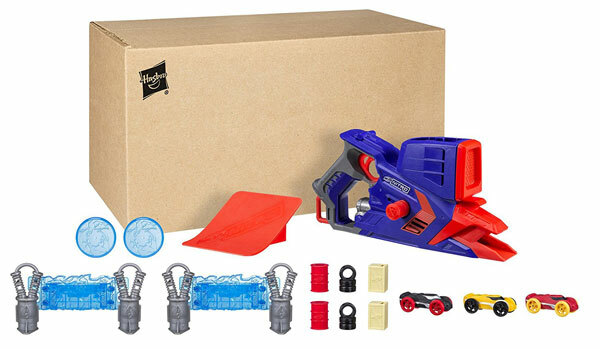 The blaster that comes with the NERF Nitro Flash Fury Chaos set can fire three of the foam cars without stopping to reload. Move the targets around after each round of shots to prove your aiming and shooting skills. Two pop-up targets provide a great place to aim your cars. Construct the targets and place them a short distance from the blaster. When the car makes contact, a flying disc explodes into the sky. Send them up to the long jump ramp to blast your cars up and over other hurdles. Six obstacles come with the set to create daring stunts for the cars. You could also use other toys or items as obstacles. Maybe line up a few toy cars and do a little Evel Knievel stunt work! 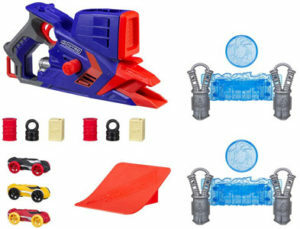 Three cars are included in the NERF Nitro Flash Fury Chaos set. They are soft, with a thick foam coating a lightweight plastic piece that holds the wheels in place – so they don’t harm anyone if they make impact during play. The cars are shaped to go fast and far with each blast. Each car features a different color scheme, perfect for multiple children playing at once. The NERF Nitro Flash Fury Chaos works best on low carpet and hard surfaces. These flooring options are better for the cars when they land and roll. And perhaps the best thing about this NERF Nitro Flash Fury Chaos set is no batteries are needed! The only power these cars need are the ones from the blaster, triggered by the push of a button.